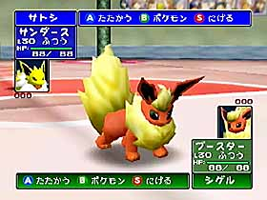 Not to be confused with the international release, Pokémon Stadium, this version was the first version, only available in Japan. Compatible with Pocket Monsters Aka/Midori/Ao (with no support for the Yellow Version), and only a limited number of Pokémon are available. Take part in Pokémon battles with different rules, or play a variety of minigames with your favorite Pokémon.